Restorative yoga is a practice that is all about slowing down and opening your body. When you take a restorative class, you may hardly move at all, doing just a few postures in the course of an hour. It is a completely different experience than most contemporary yoga. During the long holds of restorative yoga, your muscles are allowed to relax deeply. Poses are supported with blocks, bolsters, and blankets to eliminate unnecessary straining. It’s a unique feeling because props, rather than your muscles, are used to support your body. 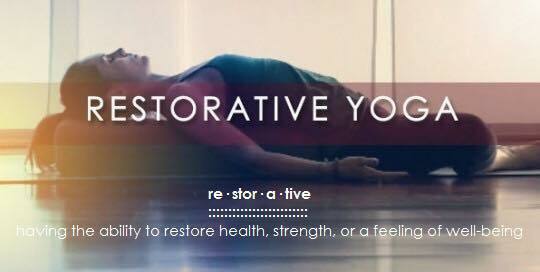 Restorative classes are very mellow, making them a good complement to more active practices and an excellent antidote to stress. Prepare yourself for deep relaxation when you attend a restorative class. Expect the teacher to arrange for the necessary props to be available for you. The lights may be dimmed and soft music played. If it is chilly, keep your socks and sweatshirt on since you will not be warming up the body the way you would be in a regular class. In some poses, the teacher may even cocoon you in blankets for extra warmth and coziness. After you are set up in a pose with all your props, you will hold the pose for an extended period, often up to ten or twenty minutes. At the end of the session, your body feels open and refreshed. I have done extensive training to teach this type of yoga and I have witnessed how powerful it can be. I hope you’ll contact me if you have questions! I offer Restorative Yoga twice each month at 6:30 pm. The schedule changes each month, so join my mailing list and/or follow me on FB (@Monticello Georgia Yoga) to see each month’s dates.